I recently purchased a PWR-6G Power Sensor and was wondering if I need to have it calibrated, or it if came to me calibrated. The PWR-6G+ is calibrated prior to shipping and therefore there is no need for calibration of new Power Sensor's, a customer can start working once the Power Sensor software has loaded and the USB cable is plugged in to the computer. We recommend sending the PWR-6G+ once a year for calibration. What is the yearly calibration cost? I noticed that, according to your specifications, your USB Power Sensor PWR-6G+ appears to be designed for CW measurements only. Does the probe respond to pulsed RF waveforms? The Power Sensor can test only CW signal and is not suitable for accurate measurements when testing pulsed RF or complex RF waveforms. Measuring signals other than CW will result in a testing fault. Is it detector thermistor based? Can the Power Sensor measure video bandwidth? The Power Sensor is based on a schottky diode. The Power Sensor cannot measure the video bandwidth. Are there any plans to produce a 75ohm version or would the best suggestion be to just use it with a matching pad and accept the reduced bandwidth and additional 5.8dB loss? At present there are no plans to develop a Power Sensor for 75ohm. In order to measure the 75ohm a matching pad must be used such as the UNMP-5075. I have a question regarding the pre-detection bandwidth of the unit. I assume that the unit measures an input frequency +/- some variation in frequency. What is the frequency tolerance required of the input signal for accurate measurement? If the frequency will shift by ±100MHz from the real freq, the inaccuracy of the power will be less then 0.1dB. Can I use the PWR-6G+ at frequencies such as 6.3GHz? Yes, but there may be some reductions in the accuracy of the readings due to the uncertainty added from a slight increase in mismatch seen by the Power Sensor. What standard is the PWR-6G+ calibrated to? The Power Sensor is calibrated in accordance to the guidelines as set forth by NIST. The measurements are traceable to national standards. I noticed from the User Guide on your web site that LabVIEW support is available and I am attempting to determine the extent of that support. Are there are application examples in LabVIEW or DLLs that can be wrapped as LabVIEW Vi s? Click on Browse and point to windows\system32\mcl_pm.dll . Make sure to connect MINI-CIRCUITS Power Sensor to USB port. Can the USB Power Sensor run under Linux? Specifically: Unix distributions: Derbian, Ubunutu, Fedora, OpenSUES, etc? At the present time the USB Power Sensor does not support Linux. We are looking to automate our power testing. Is there a capability to talk directly to the Power Sensor interface, or the interface is solely to the supplied software? Yes there is a capability to communicate directly to the PWR-6G+ by using a "com activex dll object" that we supply. 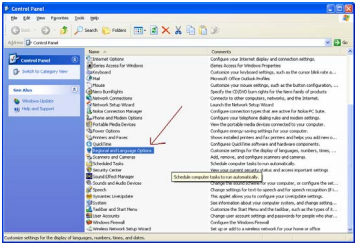 With the "com object" the user can talk with the sensor by using Visual Basic, Delphi, C++, LABVIEW and all other software that "know" to use a DLL com object. Are there any known crash issues with the PWR-6G+ software while using Excel 97 on a Windows XP (SP2) machine? You are correct. The Excel feature that comes with the Power Sensor program is for MS Office 2002 and 2003. Is it possible to use Agilent Vee with the Power Sensor? You can use the Agilent Vee with the Power Sensor. The CD contains mcl_pm.dll ActiveX that can be used in all Windows based software that supports ActiveX , and from what I see Agilent Vee supports ActiveX. Can I use NI Labview and NI LabWindows/CVI with the Power Sensor? Yes, the mcl_pm.dll file ActiveX included in the CD supports NI Lab View. And also the NI LabWindows/CVI supports ActiveX, (http://sine.ni.com/nips/cds/view/p/lang/en/nid/11104). 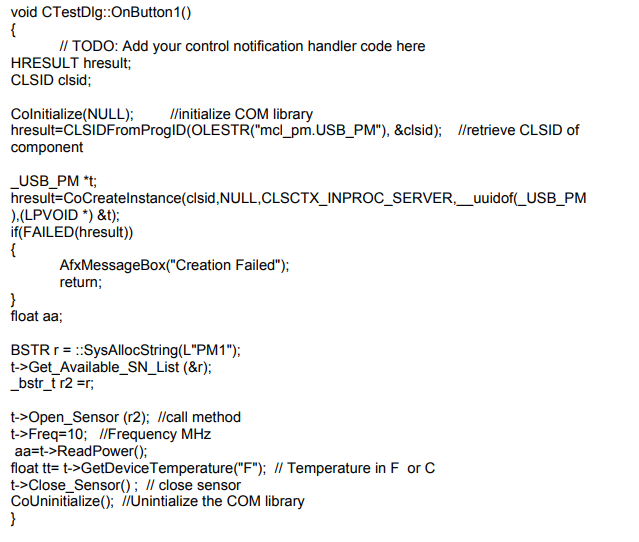 Is it possible to talk to the USB Power Sensor via their ATE software on the PC, they are using NI LabWindows/CVI. 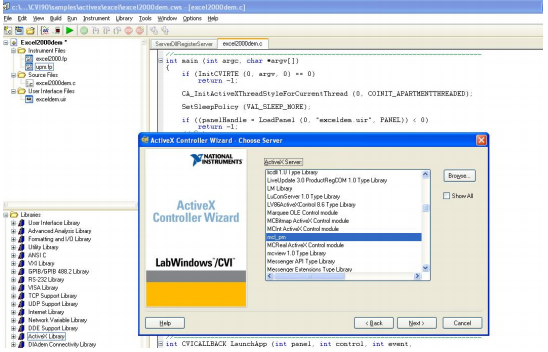 LabWindows software has the ability to work with ActiveX objects by writing C++ Cod. Following is a C++ example code that might guide you how to use Mini-Circuits Power Sensor ActiveX Object to connect to the power sensor and to read from it. Can I use MATLAB for PWR-6G+? If your version of MATLAB support working with DLL or COM object or VC++ code then yes, the PWR-6G+ can work with MATLAB. I have been trying to access the dll, but there isn't enough information in the help file - it's only a couple lines long. What we need is a header file for the dll. There is no header file for this DLL file. The DLL file is an ActiveX dll com object file. There is also a read me file for the programmers. Having done all the installation procedures of the Power Sensor, the reading which has just 1 dB steps and decimals not marked, for example if we have a reading of 10.00 dBm, we increase the power and 0.3 dB Power Sensor reading of 10.00 dBm continues, if we increase the power of reading 0.7 db rises to 11.00 dBm, we need to know if we have to do something extra to get a reading with decimals? To resolve this problem please instruct the customer to correct the Decimal point in the "Regional and Language Options" from comma (",") to dot ("."). From Start/Settings click on "Control Panel". Another way to solve this problem is to install Power Sensor ver. A10 (is on the web now). Can the PWR-6G+ interface with other test equipment that has an available USB port, or must it be connected to a computer? Mini-Circuits currently does not offer drivers for any equipment other than a PC. Is it possible to write the control software in VB or C++ of the PWR-6G+ ourselves and not install the software offered by Mini Circuits? Please follow the example in the readme txt file. I noticed when I used the control software I wrote in VB and the Power Sensor's USB plug in unplugged and plugged again the software is not responsive? Please unplug the USB cable from the PC. Then plug it again before running the program from VB. This operation is required in case the user ran the Open_Sensor command and then, shut the program before running the command Close_Sensor. I am looking for a fast Power Sensor. How fast (in mS) is the PWR-6G+? The PWR-6G+ speed is 300mS as noted on the spec sheet by using USB Hub 2.0 you can reduce the speed to 100ms. We preferred focusing on a stable and accurate reading than the speed. Nevertheless, it is fairly compatible with other Power Sensors manufacturers. Is the PWR-6G+ compatible with XP or Vista 64-bit operating system? PWR-6G+ support the Windows XP & Vista , 32 Bit and not the 64 bit.